When Michael and Dylan were born and diagnosed with Cystic Fibrosis, we set out on a mission to find a cure for our boys and give them the best life we possibly could. As we look ahead to this weekend, we continue our efforts in raising money for the Cystic Fibrosis Foundation to find a cure as we walk downtown Chicago on Sunday 5/21. AND we are equally honored this weekend to attend Make-A-Wish’s 2017 WishBall with our boys serving as Wish Ambassadors Saturday night. Our family has seen first-hand the power that a wish, ONE WISH, can bring a child deep in a complex medical fight. Earlier this year, our son Michael was granted a wish by the Make-A-Wish Foundation. 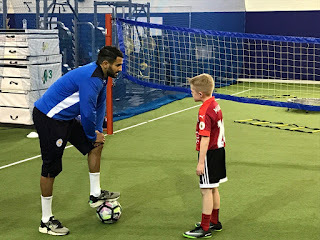 Our family embarked on a remarkable trip for Michael to meet and play with his soccer idol, Riyad Mahrez, who plays for Leicester City Football Club, in Leicester, England. Last year, LCFC made sports history by winning the English Premier League (as a 5,000 to one shot!) with Mahrez as a leading scorer. This was a team that had just come into the English Premier League two years prior and ended up taking the biggest title of the season, even over names like Chelsea and Arsenal. And the miraculous thing is that Michael loved and followed Riyad Marhez and LCFC’s rise to greatness the entire season. I distinctly recall watching Michael stand in awe in our home in the Chicago suburbs, watching his idol, hoist and kiss the cup all the way on the other side of the world when they won. I remember seeing Michael’s eyes flicker with excitement as his rosy cheeks grinned. And in the same way LCFC battled through the Premier League game after game, the odds are often stacked against these Make A Wish kids, patients waging war on their disease. And it’s amazing how grand it is. 5000 to one. But that one, that ONE, can be EVERYTHING. One time when it’s not about pills... or medications... or machines... or IVs... or x-rays... or medical tests... or drug infusions... or breathing treatments. It's not about doctors... or appointments... or nutrition... or blood sugar. One time with it's not about CF. One universal language of sport. One unique bond and passion for a game. One grand entrance in a stadium of 31,000 fans. One unforgettable experience that only the pros know. All. All of it. starting with One. Wish. And as for Michael and his story, we know that sharing about his wish journey will help so many others to understand how it can lift a kid up in a such a way that nothing else can. A wish can help kids dream big. A wish can fuel the passion to take their disease and medical complications head on. A wish can give hope and inspiration and excitement. It’s not about kids who are dying, terminal or end-stage. Nope. It’s about kids who are fighting battles, VERY BIG BATTLES, and battles that at times might even be invisible to others as is the case with our boys. Instead, it’s about those kids truly LIVING and soaking up LIFE even in the face of all that their diagnosis brings. The odds for these kids, the odds for that pro soccer team in England. I have written about odds in our family's journey with CF before here. CF is rare. Our odds of having two kids with CF are crazy. And the odds in the CF battle are pretty rough too. So, given a chance to improve those odds, with say a wish, put simply, it’s PRICELESS. 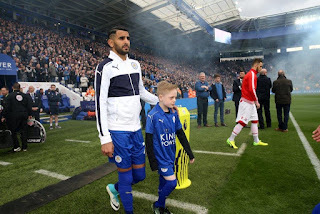 I think of it like, for Michael to receive a such a remarkable wish, to give him leg up in his fight against Cystic Fibrosis is no different than LCFC’s roster receiving the magical Riyad Mahrez on their journey into sports history. When we left England, Michael was more adamant than ever that he WILL some day be a pro soccer player and he WILL live in England. Even LCFC head coach exclaimed when he met Michael and saw his foot on the ball, “this one has proper skills” as he pointed to Michael. Later, when writing his thank you card to Coach Shakespeare, Michael wrote "I hope to one day play for your academy”. So perhaps it’s not too far off. I believe with all that I know about the advancements for CF patients on the horizon, all I know about Michael's battle against CF, about his love for soccer, and now after his extraordinary wish experience this spring, and with all I know about amazing people making a difference for these wish kids… I believe he will fulfill that pro baller dream. I, as his mom, can have that ONE hope. 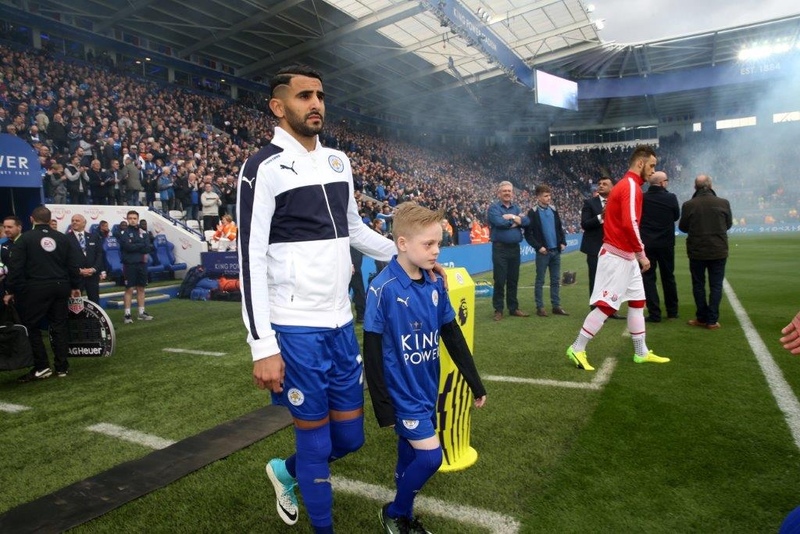 With Michael on the pitch, no matter the odds, no matter how insurmountable they may seem, AFTER HIS WISH EXPERIENCE and a taste of the Pro experience in Leicester, England, all possible through the Make-A-Wish Foundation, I will put my money on Mikey any day. Even if it is 5,000 to ONE. This weekend our family once again continues to raise money in support of the Cystic Fibrosis Foundation. Just as Michael continues his soccer dream fueled by an incomparable wish experience. Thank you to our beloved Cystic Fibrosis Foundation for adding tomorrows. And thank you to Make-A-Wish for helping him dream up what to do with all of those tomorrows. Two Salty Boys has been selected by our panelist as one of the Top 75 Cystic Fibrosis Blogs on the web. I personally give you a high-five and want to thank you for your contribution to this world. This is the most comprehensive list of Top 75 Cystic Fibrosis Blogs on the internet and I’m honored to have you as part of this! To help find a cure for the Salty Boys, CLICK HERE. To know the Two Salty Boys' story, start here at the beginning. I am a stay-at-home mom of 8 year old, Michael, and a 6 year old, Dylan. Both of our sons have Cystic Fibrosis, a genetic disorder that causes severe digestive complications and life-threatening lung infections, among other serious conditions. From the absurd to the beautiful, I am trying to take it all in, while dodging all the 'life' things flying in my direction. Join me for the ride.